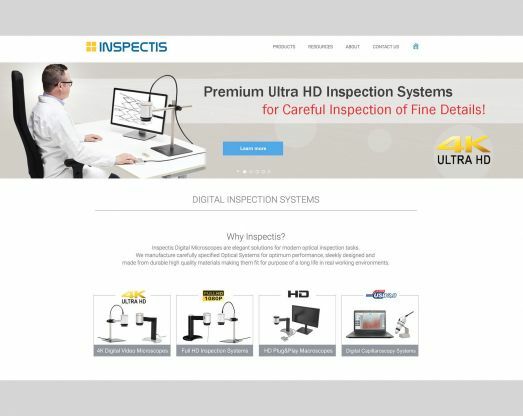 Solna, Sweden – INSPECTIS AB announces the launch of its updated inspect-is.com web site, interactive and easier to navigate than ever before, a comprehensive online resource covering all of INSPECTIS’ advanced optical inspection solutions for PCB assembly and Medical Device manufacture, including the newest and most powerful (up to 30X Zoom) line of Ultra HD (4K) Digital Inspection Microscopes including Inspectis U30, a premium all-in-one, Ultra High Definition 8.3 megapixel optical inspection system. 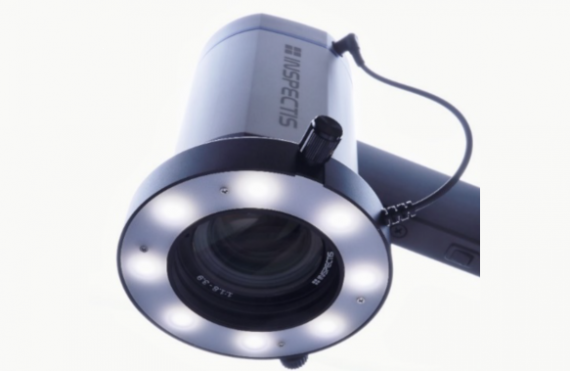 The updated site shows all of INSPECTIS’ full line of plug and play, reliable, and cost-effective camera microscopes, all of which are designed for non- contact optical inspection, quality control, repair and rework. The site also shows the many accessories available with the systems. These unique accessories, properly applied, enhance the power, range, and flexibility of INSPECTIS digital inspection systems and microscopes, and include such accessories as ring lights, filters, lenses, image capture devices, remote control consoles, an X-Y Rail system and floating X-Y table. Downloadable specification sheets are readily available, and links to product demonstration videos help the visitor see INSPECTIS products ‘in action’. For more information, visit www.inspect-is.com. 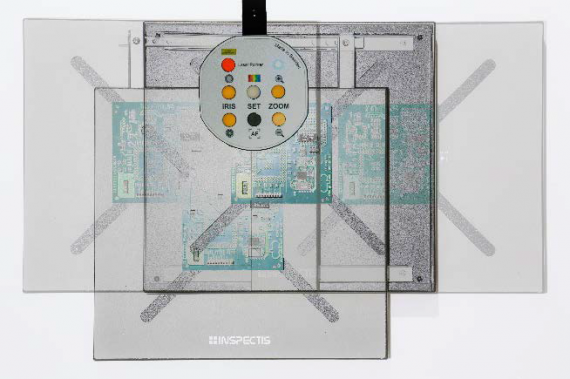 INSPECTIS is a new line of advanced optical inspection solutions for electronics and PCB manufacturing industries. INSPECTIS offers a line of plug and play, reliable and cost-effective digital camera microscopes designed for non-contact optical inspection, quality control, repair and rework, and more. For more information, visit www.inspect-is.com; email alistair@inspect-is.com. Solna, Sweden – The new HD-028-L from INSPECTIS AB is an innovative X-Y Floating Board with a position locking mechanism. The HD-028-L provides smooth lateral movement of inspection objects (SMT PCBs, medical devices) under a microscope or INSPECTIS high-performance video microscope inspection systems, and the mechanical position locking mechanism provides maximum stability by preventing accidental movement of the part or floating table during examination. The working surface is covered by a high-friction antistatic mat that keeps the inspection object in place. 4 slots are available for attaching optional magnetic pegs (HD-128 Magnetic pegs (4x) or custom-made fixtures and holders. The board itself is made of high quality antistatic coated material. 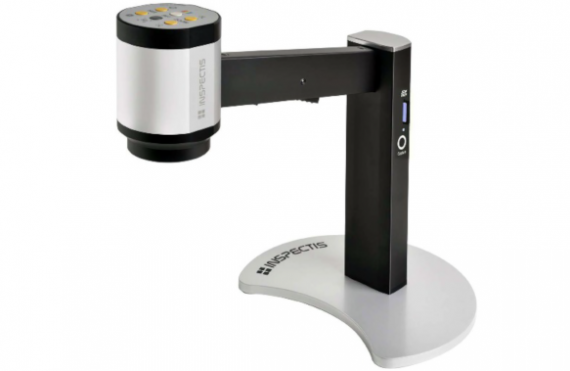 Solna, Sweden – INSPECTIS AB announces a new generation of the U30 series digital microscopes. The U30s, U30 and U30s EWD versions offer more than twice the magnification (x168 with +10 macro lens) of the current U10 series, raising video inspection to new levels. The U30 features fast responsive auto focus, he adds, making hand held inspection remarkably easy, allowing, an operator to quickly see, for example, if 01005 components are set properly. 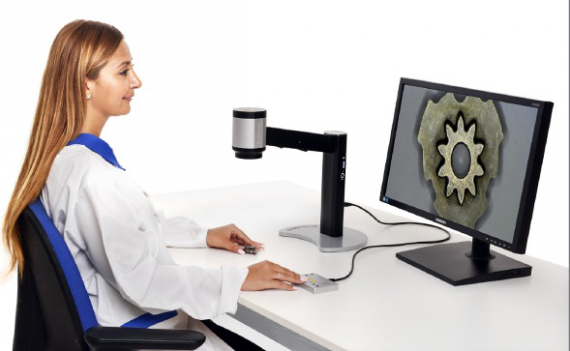 The Inspectis 4K Digital Microscopes are available in two basic models: U30, an all-in-one, plug-and-play system with integrated aluminum stand and built-in adjustable white LED illumination, and U30s, a stand-alone, totally configurable system with a variety of mounting solutions. Select between any of Inspectis’ Boom type, XY-type or Articulated arm stands. For more information, visit INSPECTIS at SMTAI 2018 in Booth #723, or visit www.inspect-is.com. Solna, Sweden – Complete and comprehensive precision inspection of parts and assemblies is easier and more precise when the objects under inspection can be inspected from various angles and heights, not just straight up and down. 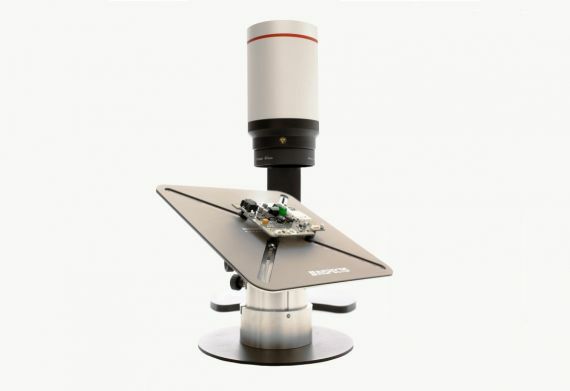 That’s why Inspectis AB has introduced the HD-150 Combined Tilt and Telescope Table, so that an object such as an SMT/PCB assembly or a Medical Device can be tilted up to 30⁰ in all directions, and at various user-adjustable heights under the Inspectis video microscope camera. The HD-150 is a universal solution, usable with any of the Inspectis all-in-one cameras (C12 Series, U10 and the new F30) when using additional +2, +3, and +5 diopter macro magnification lenses. popular HD-029 Tilt table and uses the same proven high quality anti-static coated material as other Inspectis accessories, and the surface of the tilt board is covered with a high-friction antistatic mat to keep the object under inspection firmly in place. Four (4) slots are available for attaching Inspectis HD-128 magnetic pegs or custom-made fixtures and holders. Photo Caption: HD-150 in use with C12 and +5 lens. The board is resting on the ESD-safe HD-128 magnetic posts. Solna, Sweden – The best Full HD Digital Microscope technology isn’t providing optimum results if its image is compromised by less than the best lighting technology. To get the best inspection results and imagery out of the powerful INSPECTIS system, the lighting has to be up to snuff. That’s why INSPECTIS AB announces the availability of its new HD-024-B White LED Ring Light. The all new HD-024-B provides the best light matched to the capabilities of the INSPECTIS system, and also makes the light easier to use and adjust. In keeping with the clean, simple equipment approach of INSPECTIS, it also prevents wire clutter. The new HD-024-B is powered directly from the INSPECTIS camera that’s being used via the AUX power outlet found at the top-right side of the camera housing. The heavy benchtop control unit has been eliminated along with the cables that ran to it, instantly improving cable management by eliminating unnecessary cables. It’s powerful yet simplified and easy to use; its integrated on-off/ brightness control is conveniently located on the right-hand side of the unit. The HD-024-B incorporates 8 high-power white LED lamps for various incident light applications, providing homogenous illumination at pure daylight white color. Accessories include an attachable Polarizer/Analyzer filter set for removing glare and a Diffuser filter for extra smooth and soft illumination. Solna, Sweden – INSPECTIS AB announces the availability of its new HD-050 Telescopic Height Adjustment Table, a powerful solution that expands the flexibility of working distance achievable with the popular C-12 and U10 (with its supreme 4K resolution). The HD-050 features a 3-stage telescopic post that provides convenient height steps and allows step-less height adjustment between 52 to 155 mm. The object table has the same dimensions and format as the popular HD-029 Tilt table and uses the same proven high quality anti-static coated material as other INSPECTIS accessories including the popular tilt table and X-Y board. 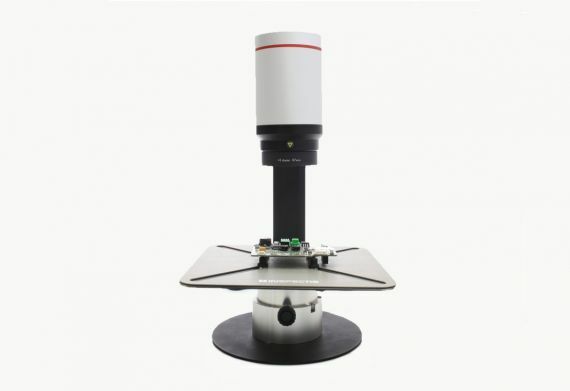 The INSPECTIS Telescopic Height Adjustment Table provides 103mm vertical displacement of your inspection objects along optical axis of the digital microscope when +1, +3 and +5 diopter macro lenses are used. Solna, Sweden – INSPECTIS AB announces the launch of the Full HD Digital Microscope F30s, the most adaptable and versatile FHD vision inspection system available, an all-around ‘best choice’ for the widest range of visual inspection applications. fps HDMI output, superior 30:1 zoom optics with auto-focus, and a generous practical working distance. Additionally, the F30s is designed for outstanding performance even in poor light conditions. Objects under inspection are rendered sharp, clear, and large; its 56x screen magnification on a 24” monitor, for example, can be increased up to 200x with auxiliary lenses. In common with all INSPECTIS digital microscopes, the F30s incorporates design features that can significantly reduce the time spent on inspecting parts compared with other optical visual systems. The unique ergonomic design allows operators to sit comfortably in a good working position, providing relief to eyes, neck and shoulders. INSPECTIS digital microscopes offer true ease of use with minimal interaction needed with controls and settings. Basic parameters including zoom, brightness and color levels can be controlled by the user through on-board buttons on top of the device. Additional control functionality can be added using an optional feature-packed remote control or via dedicated PC software. An optional built-in laser pointer aims at the area of interest and assists in quickly locating it on the screen whilst efficient object handling is aided by the full range of thoughtfully designed accessories including a complete range of mounting / stand options and ESD protection. Solna, Sweden – INSPECTIS’ new 4K Ultra HD Digital Microscope U10 and U10s models quite nearly turn an inspection station into a big-screen cinema movie theatre with unparalleled Ultra HD (4K) resolution of 3840 x 2160. Clear, ergonomic inspection is made quite literally clearer, easier, crisp and vibrant with premium imaging quality available in two basic models: U10, an all-in-one, plug-and-play system with integrated aluminum stand and built-in adjustable white LED illumination; or U10s, a stand-alone, totally configurable system with a variety of mounting solutions. Select between any of INSPECTIS’ Boom type, XY-type or Articulated arm stands, X-Y table, Tilt table, and Telescopic height adjust table for fixed stands. 4K Ultra HD Digital Microscope U10 is an all-in-one, plug and play solution, whereas U10s is a stand-alone, totally configurable inspection solution. Both systems offer a number of distinctive, innovative features including superior 10:1 zoom optics with auto-focus, the capability to switch between UHD 4K and FHD output, a large practical working distance, and delivery of outstanding performance even in poor light conditions. A key feature and capability is Ultra HD 4K 30 fps for careful inspection of fine detail, and Full HD 60 fps for lag-free magnified working. One may connect a U10s digital microscope to a 4K UHD display or a PC via INSPECTIS ´ plug-&-play USB3.0 converter and take advantage of the astonishing image resolution, high contrast, true colors at 1:10x zoom range. The INSPECTIS U10 and U10s digital microscopes can significantly reduce the time spent on inspecting parts compared with other optical visual systems. optics and a sensitive image sensor, U10 series provide astonishing images of the inspected object with minimum glare and reflections. A wide range of diopter Macro Lenses can be added to magnify up to 50x. INSPECTIS digital microscopes offer true ease of use with minimal interaction needed with controls and settings. All basic parameters including zoom, brightness and color levels can be controlled by the user through on-board buttons on top of the device. An optional built-in laser pointer aims at the area of interest and assists in locating it on the screen. Solna, Sweden – INSPECTIS AB announces the availability of two new X-Y accessory products for its class-leading digital video inspection systems, the HD-028 X-Y Floating Table and X-Y Rail and Boom Systems. 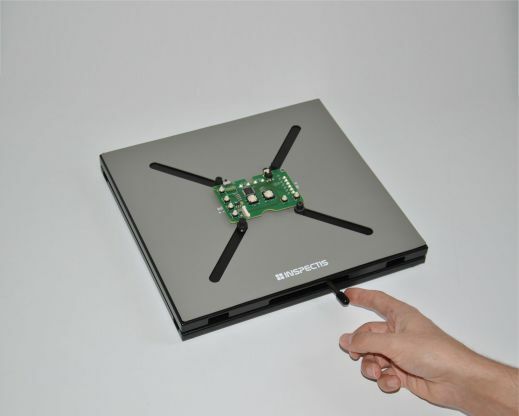 The Inspectis X-Y Floating Table provides smooth lateral movement for objects under inspection. Its working surface is covered with a high-friction, high-quality antistatic coated mat that keeps objects under inspection in place. Four (4) slots are available for attaching custom magnetic fixtures and holders. 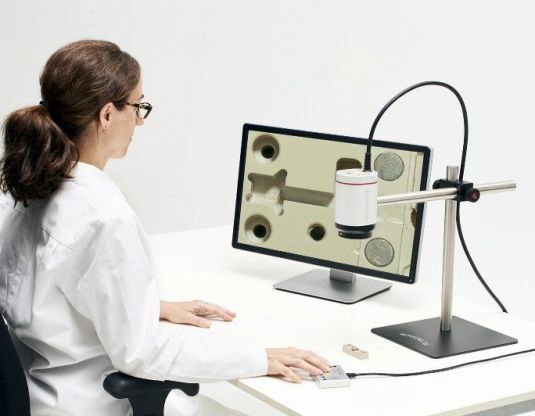 The X-Y Floating Table allows the camera to remain static on one of the wide range of stands while the object under inspection is moved and smoothly positioned with ease and precision. Compared to previously available products, it is lower in profile and more compact yet still offers a practical-sized working area and large movement in both X and Y directions. Sometimes a static camera is not convenient or simply won’t reach a suitable viewing position. The fully configurable Inspectis HD camera systems can be mounted on a range of rack or bench-mountable X-Y Rail and Boom Systems to place the camera over any large object, or can be integrated into a production environment occupying minimum or no bench footprint. They provide travel of the camera over an object of up to 900mm in the X and 600mm in the Y directions as specified by the customer. All versions feature smooth running ball-race runners and double-boom running in ball bearings for effortless positioning. All Inspectis cameras feature crucial on-board controls ideal for X-Y mounting so that single-handed operation of positioning and zooming is possible. 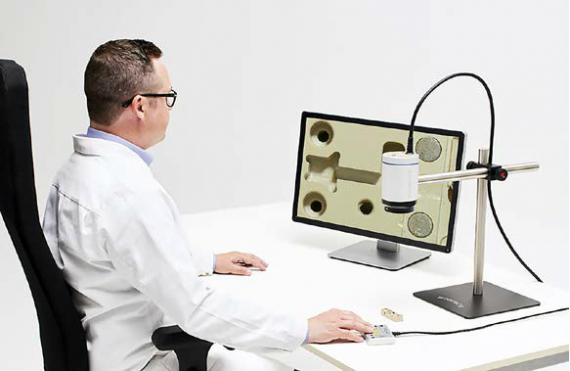 Solna, Sweden – Remarkably uncluttered, and thoroughly ergonomic, the new C12 High Definition Digital Microscope from INSPECTIS AB offers innovative new features and performance not found in competitive systems. The C12 is a plug & play, reliable and cost effective high definition camera microscope designed for the most challenging SMT/PCB electronics assembly and rework applications, an All-in-One optical digital inspection system with 12:1 optical zoom, auto focus, integrated illumination, on-board controls and SD-card image capture. 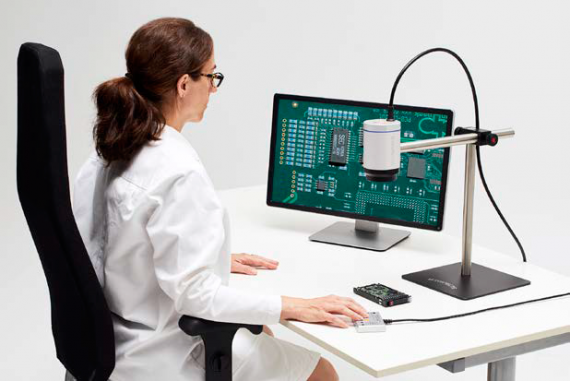 The C12 produces crisp images of inspection objects up to 90x magnification directly on an LCD monitor or PC. An optional built-in laser pointer aims at the area of interest and assists in locating it on the screen. Due to the large size of its image sensor and pixel elements, C12 provides excellent image of such structures as solder joints on PCB assemblies with minimum glare and reflection. Free of cords and clutter, the C12 offers true ease of use with minimal interaction needed with controls and settings. All basic parameters such as zoom, brightness and color levels can be controlled by the user through on-board buttons on top of the device, or through an optional remote control pad. With these control features, camera and lens attributes, including focus, aperture size, image contrast and white balance, are all controllable, and features including zoom factor display and a crosshair overlay on the live image can be turned on. Optimized settings can be saved and recalled for individual samples, and to further simplify operation, selected functions can be controlled by a foot pedal. The Inspectis C12 significantly reduces the time spent on inspecting parts when compared to other optical visual systems.